I drove over to the local greenhouse this afternoon to get a few more plants to fill the whiskey barrels. It wasn't open, but my trip was not wasted. I saw a couple of junior high-aged boys chasing something in an empty parking lot. 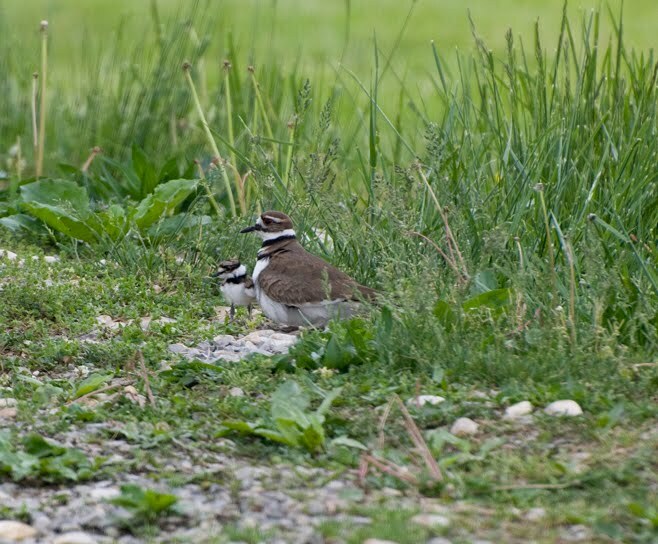 It turned out to be 2 Killdeer chicks. When I pulled over to talk to the boys they said they were trying to get the babies to go back to their parents. 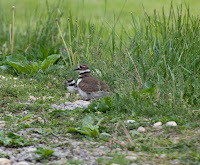 I explained that parents were near by and the chicks were OK. Later this afternoon I went back with my camera and telephoto lens. Fortunately, the road and parking lots were empty, so I could stop and take pictures without being in traffic. At first I saw only 2 babies. 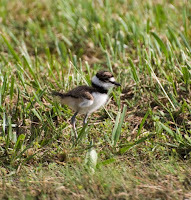 They were quite active little creatures, running around very fast between a large puddle of water, the grass and the driveway. I could hear their mother calling from the edge of the driveway. I noticed the driveway had large white gravels, what w ould have been perfect camouflage for her eggs. When she moved, I noticed another tiny ball of fluff move, it was baby #3! 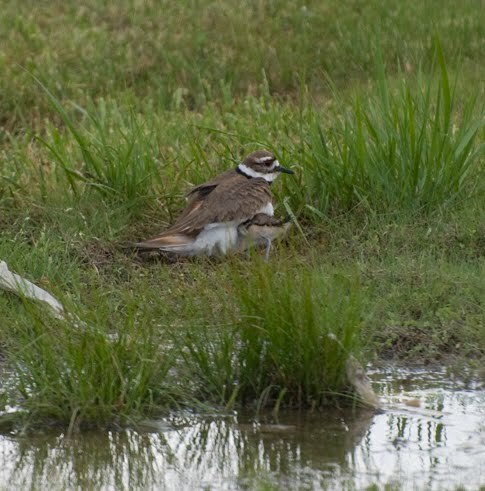 A few minutes later, Mom walked over to the large puddle and called to her chicks. She raised her wings, fluffed her feathers and all three babies cuddled underneath. 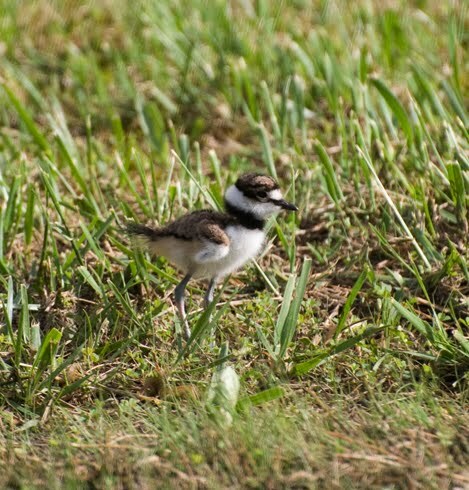 Killdeer chicks are precocious, meaning they are able to run around and feed themselves very shortly after hatching. 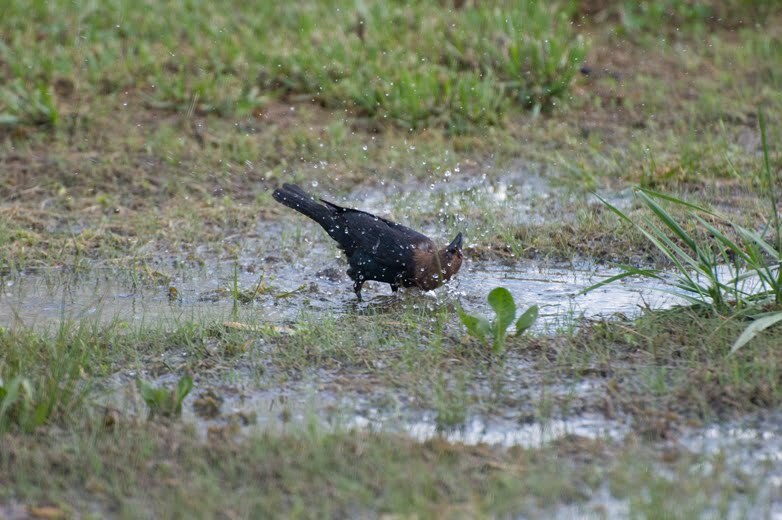 A male Cowbird flew down to the puddle, not to eat, but to bathe. He splashed around quite a bit. I caught him in action in this photo! I got tickled this morning when I noticed a squirrel running around frantically in a tree in our neighbor's yard. 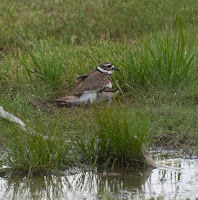 Finally I saw why, it was being chased relentlessly by a robin. I assume it had come too close to her nest. She continued to chase it when it ran on the ground to get to another tree. I wish I could have caught that on video!